This medication can decrease your body's ability to fight an infection. This effect can lead to very serious (possibly fatal) infections (such as fungal infections, bacterial infections including tuberculosis). You should have a tuberculosis (TB) skin test before and during treatment with this medication. Also tell your doctor your medical history, especially of past/recent/current infections. You should also tell your doctor if you have lived or traveled in areas where certain fungal infections (such as coccidioidomycosis, histoplasmosis) are common or if you have been near someone with tuberculosis. Areas where these types of fungal infections are commonly found include the Ohio and Mississippi River valleys and the southwestern United States. See Side Effects section for symptoms of infections to watch out for, and get medical help right away if you have any of these symptoms. The immune system also helps prevent and control cancer. There is a very small risk (especially in children/teens/young adults) of developing cancer (such as lymphoma, skin) due to this medication or due to your medical condition. A rare, mostly fatal cancer (hepatosplenic T-cell lymphoma) has occurred in people receiving this medication along with certain other drugs (azathioprine or 6-mercaptopurine) to treat Crohn's disease or ulcerative colitis. Talk to your doctor about the risks and benefits of treatment. Tell your doctor right away if you have symptoms such as unusual lumps/growths, swollen glands, swollen or painful abdomen, unexplained weight loss, unusual tiredness, loss of appetite, fever that doesn't go away, or night sweats. Who should not take Inflectra Vial? What conditions does Inflectra Vial treat? Headache, stomach pain, or nausea may occur. If any of these effects last or get worse, tell your doctor or pharmacist promptly. Symptoms of an infusion reaction that may occur during infliximab-dyyb treatment include pain/swelling at the injection site, shortness of breath, flushing, chills, fever, headache, and rash. If you have any of these symptoms, your healthcare professional may need to adjust/stop your infusion and treat your symptoms. Tell your doctor right away if you have any serious side effects, including: joint/muscle pain, swelling ankles/feet, easy bruising/bleeding, vision changes, seizures, confusion, muscle weakness, numbness/tingling of arms/legs, butterfly-shaped facial rash, chest pain, pain/redness/swelling of arms or legs, fast/slow/irregular heartbeat. Tell your doctor right away if you develop signs of infection while using this drug, such as: cough/sore throat that doesn't go away, fever, chills, night sweats, trouble breathing, painful/frequent urination, unusual vaginal discharge, white patches in the mouth (oral thrush). This drug may rarely cause serious (possibly fatal) liver disease. Get medical help right away if you have any symptoms of liver damage, such as: extreme tiredness, nausea/vomiting that doesn't stop, loss of appetite, stomach/abdominal pain, yellowing eyes/skin, dark urine. A very serious allergic reaction to this drug is rare. However, get medical help right away if you notice any symptoms of a serious allergic reaction, including: rash, itching/swelling (especially of the face/tongue/throat), severe dizziness, trouble breathing, difficulty swallowing. List Inflectra Vial side effects by likelihood and severity. Before using infliximab-dyyb, tell your doctor or pharmacist if you are allergic to it; or to mouse proteins; or if you have any other allergies. This product may contain inactive ingredients, which can cause allergic reactions or other problems. Talk to your pharmacist for more details. Before using this medication, tell your doctor or pharmacist your medical history, especially of: tuberculosis (previous infection or positive skin test), past/recent/current infections (such as cold sores, valley fever), heart disease (such as heart failure), blood/bone marrow disorder (such as leukopenia, thrombocytopenia), nervous system disorder (such as numbness/tingling, seizures, multiple sclerosis), history of cancer (such as breast cancer, skin cancer, lymphoma), a certain lung disorder (chronic obstructive pulmonary disease-COPD), liver disease (such as hepatitis B), light treatment for psoriasis (phototherapy). 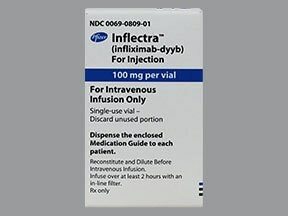 Infliximab-dyyb can make you more likely to get infections or may worsen any current infections. Avoid contact with people who have infections that may spread to others (such as chickenpox, measles, flu). Call your doctor if you have been exposed to an infection or for more details. Older adults may be more sensitive to the side effects of this drug, especially risk for infections. What should I know regarding pregnancy, nursing and administering Inflectra Vial to children or the elderly? Some products that may interact with this drug are: other drugs that weaken the immune system/increase the risk of infection (such as abatacept, anakinra), treatment with weakened bacteria/viruses (such as live vaccines, BCG for bladder cancer). Does Inflectra Vial interact with other medications? Lab and/or medical tests (such as complete blood count, liver function test, skin exams) should be done while you are using this medication. Keep all medical and lab appointments. Consult your doctor for more details. For the best possible benefit, it is important to receive each scheduled dose of this medication as directed. If you miss a dose, call your doctor or pharmacist right away to establish a new dosing schedule. Do not double the dose to catch up. Are you taking Inflectra Vial? Are you considering switching to Inflectra Vial? How long have you been taking Inflectra Vial?